Scaling-up ecological patterns and processes is crucial to understanding the effects of environmental change on natural systems and human society. We are piloting a Data Science Challenge to help scientist do this better by using remote sensing from low flying airplanes to infer the location and type of trees in forests. This will allow forests to be studied in detail at regional to global scales. Anyone is welcome to participate. Work as teams or individuals. Sign up. The competition is now closed. We will be running a new round on Summer 2018! Airborne remote sensing: High resolution hyperspectral imagery, higher resolution RGB imagery, and LiDAR data on plant height. 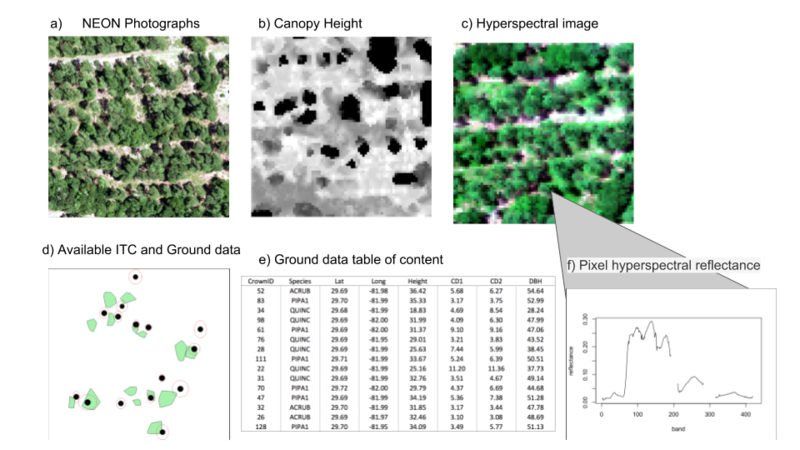 Individual Tree Crowns: Ground based identification of tree crowns on remote sensing imagery. We will back in touch on Summer 2018. We’ll be running a full version of the challenge next year. Sponsored by the National Institute of Standards and Technology (NIST) Data Science Evaluation (DSE) Series and the Gordon and Betty Moore Foundation’s Data-Driven Discovery Initiative through grant GBMF4563. Organized by the Data Science Research lab, the WEecology lab, and Stephanie Bohlman’s lab all at the University of Florida. The data is collected by National Ecological Observatory Network (NEON) from the Ordway-Swisher Biological Station (OSBS) NEON site and by researchers at the University of Florida.